Many times we think of gift cards as one step short of “I forgot to get you a gift, so I got you one of these”. And while there may even be a lot of truth to that assumption, some gift cards are more welcome than others. 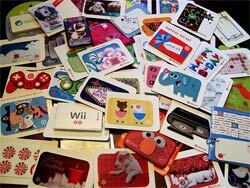 In fact, there are some gift cards we might like getting even if we don’t usually like getting gift cards in general. What makes one gift card seem more thoughtful than another? Now this list isn’t meant to say that your Uncle Howard, who loves to golf, wouldn’t appreciate a gift card to a prominent local golf shop—if you have the luxury of being able to be that specific then go for it. But what we’re aiming for is the more typical situation where either you don’t know what to buy a person, or where there’s really no time to shop for something truly thoughtful. Kids are usually easy to buy for—ten minutes at Toys R Us and problem solved. And people who are close to you and have specific interests (like the aforementioned but completely fictitious Uncle Howard above) are also pretty easy to buy gifts for. But let’s face it, most everyone else falls somewhere between difficult and impossible. For this vast group, a thoughtfully chosen gift card can be easier on you, and infinitely more appreciated than a carefully selected item that the recipient will never use. So what kind of gift cards qualify? Malls typically sell gift cards that are good at any store in the shopping center, including restaurants. If the mall has 200 stores, then the gift card will be 200 times better than a gift card from any one store in the building. Since most people hit the local mall at least a few times a year, you can know that the card will be used sooner or later. This is the online extension of the mall gift card. I don’t know if you shop on Amazon.com, but more and more people do every day, so even if the person you’re getting the card for hasn’t shopped there in the past, his day is coming! Amazon.com is an online mall that has nearly everything you can imagine—new and used—and some of the best prices you’ll find anywhere. Even if you don’t like Starbucks coffee, it’s now a fact of life that the chain has become something like air and water–it’s everywhere! Universal location means nearly everyone goes there, if only because they have a friend, co-worker or client who likes it. You can’t go wrong with cards from this chain. A trip to the local movie theater is no longer an inexpensive outing, especially for families. At a minimum, a gift card here can contribute to a less expensive evening out, and who wouldn’t want that? What you should look for are gift cards to the major movie theater chains, like AMC and Regal. Not only do they typically have large regional movie theaters in the local area, but they have them in and around virtually every city in the country (portability and re-gifting). Perhaps the most universal of all gift cards, if only because everybody needs to eat. Even if a person doesn’t shop at the grocery store the card is for, anybody would be more than willing to go to that store to buy a steak or a bottle of wine that they don’t have to pay for. Bonus: grocery store gift cards may be the most thoughtful gift you can give to a person who’s having trouble making ends meet. Wal-Mart, Target and Home Depot are as close as retail comes to universal application. Nearly everyone will shop at each of them sooner or later. Best of all, these merchants are on the high end of the affordability spectrum. The cards may not provide anything like the warm and fuzzy feeling gifts are meant to generate but rest assured—they will be used! We gave these out for Christmas and they were a big hit. There’s a small fee, but they have the advantage that they can be used virtually anywhere a credit card is accepted, making them nearly as good as cash. The bearer is never locked into redeeming them at a specific retailer or type of retailer. Bonus: try giving one of these to a kid and see if you don’t become their favorite aunt/uncle/cousin/etc. in short order. The child doesn’t see a gift card, he sees a credit card–and that’s big time! Bonus #2—they’re “rechargeable”, so they can be used again and again, if mom and dad see fit to do so. What do you think about gift cards? Are there any you would add to the list above? I have always liked gift cards. But as of Jan 2011 in the state of CA, all gift cards are taxed at about 10%. When the person uses it they are taxed again (10%) on the merchandise. It is all in an effort to make money for the bankrupt state. Cash is king. Wow, why do ANYTHING in CA then? Do they realize what they’re doing to businesses by doing that? Here’s to not living in CA. Anyway…what about the fees many merchants take out when a gift card isn’t used within a certain time frame? DH has two from Xmas 2009, and I wonder if it’s even any use trying to redeem them at this point. Emily, I’ve heard about what you’re describing. I’d try to use the cards and see what happens. Usually, you have a year for fees to apply. My experience with gift cards is that we, and those we give them to, redeem them almost immediately. Which with all the issues like the one you’re describing floating around out there, is highly advisable. We give them mainly to kids and to people with immediate needs. Personally I wouldn’t give them to any other type of recipient for exactly that reason. The basic theme of the post of course is to give gift cards that the majority of people are highly likely to use. But I can see the problem you’re describing if you have one or more cards to specialty merchants you aren’t likely to use very often. In addition to being unlikely to be used, they’re also very likely to be put on a shelf and forgotten. Next post: Where Are Your Kids Learning About Money?